We're only 30 seconds into our six-minute phone interview, and 24-year-old country music star Kelsea Ballerini has already surprised me. On the one hand, she possesses the playful bite, infectious Southern twang, and deeply instilled professionalism I expected when dialing in. On the other, she harbors an intense love for $2 glitter, scouring Urban Outfitters for new skincare products, and indulging every so often in an epic combo of nuggets and wine. Oh, and did I mention she's also insanely friendly? "How are you?!" she asks the second we're connected via conference call. Born and raised in Knoxville, Tennessee, Ballerini's ascent to fame has been a sharp one—one that feels written in the stars, even. (Reportedly, the first song she ever wrote was one for her mom at the age of 12.) Within just two short years, she's written and produced just as many albums—The First Time and Unapologetically (a record that the singer says captures the past few years of her life). The result: a heartfelt collection of melodies you'll have a hard time getting out of your head. More tea, anyone? In summer 2015, her debut single, "Love Me Like You Mean It," reached the top of the Billboard Country Airplay chart—the first time a solo female country artist achieved the feat since back in 2006. (Anyone remember a little song called "Jesus, Take the Wheel" by a certain Carrie Underwood?) Additionally, the singer took a slot on Forbes's 30 Under 30 in 2017 and has been nominated at nearly every big awards show, from the Country Music Awards to the Grammys. 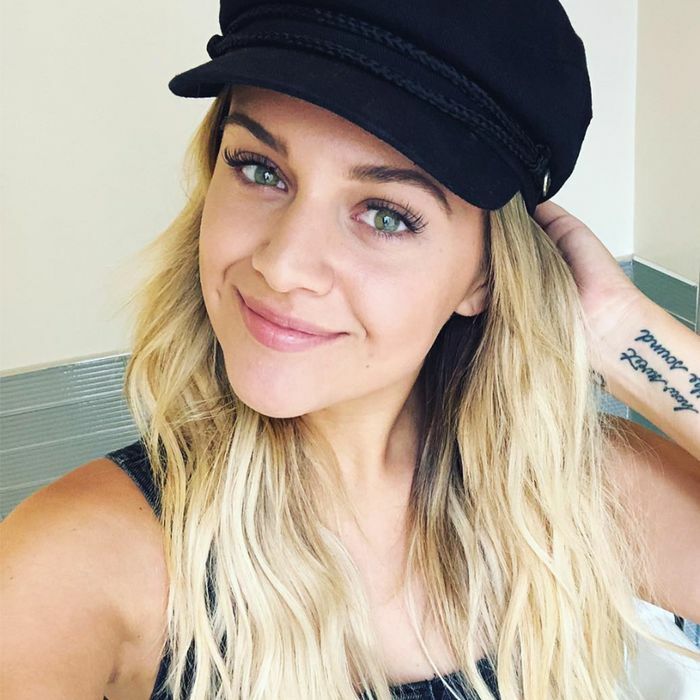 In addition to being incredibly driven, Ballerini is also an especially fun celebrity to follow if you're a beauty and wellness aficionado. She regularly talks all things fitness, makeup, and skincare on her social platforms, and attend just one live show and you'll likely gain an admiration for her statement-making beauty MO—think over-the-top but never overdone. To explain further, we took a moment to chat with Ballerini on the phone. Ahead, six minutes with Kelsea Ballerini—speed-dating style. So I follow you on social media, and it seems like you have a genuine love of beauty. Have you always? You know, I have! I almost feel like hair and makeup is another creative outlet. It's kind of like painting, in a way—I always say if I wasn't doing music, I'd probably be a hair or makeup artist. I think of it as just another way to channel creativity. Oh, completely! So what gets your creative juices flowing more—hair or makeup? Probably more makeup, just because I feel like you can really change your whole face or the entire vibe of your look or the outfit you're wearing. As a performer, you're able to experiment all the time. What products are you always wearing onstage no matter what? Glitter! (Laughs.) Yes, always glitter. And you know, I actually have eyelash extensions, and I SWEAR by them. Wait, back to the glitter for a second—what brand do you use? Ohhh, so you're talking legit craft-store glitter?! Love it. Okay, another question—how do you keep your skin so clear? I mean, what you do involves so much makeup, sweating, and traveling… basically all the things that wreak havoc on skin. Okay, I'm not as good as I should be about it. But as I've gotten older, I've really learned how important it is to take care of my skin. So whenever I'm not wearing super-glam makeup, I always have some kind of sunscreen on because I think that's really important. And then at night I always try to use a makeup wipe. That way at least I'm doing something even if I'm not doing the wholeeeee situation. What about on-flight skin secrets? I mean, unless it's a super-long flight, I don't really do much! But recently I actually had a really really crazy travel day, so I brought all of my serums and creams in a bag, and I just made sure I had a thick layer of moisturizer on my face at all times. Flying just dehydrates you SO much. Not only internally, but your skin too. Totally. Okay, let's get into the juicy stuff. What are some of the specific skincare products you swear by? There's this color-correcting cream from Kiehl's that I'm absolutely obsessed with. [Ed. note: After some sleuthing, we found out it's the brand's Super Multi-Corrective Cream, $84.] It's in this pretty purple jar, and it's this really sticky consistency, and I swear by it for long flights. I'll put it all over my face. There are two types of people in this world—are you one of the ones who will put a face mask on mid-flight? I love face masks! To be honest, I kind of use whatever sheet masks I can find at Sephora or Urban Outfitters. I love a good sheet mask. And I also try to use products with lots of vitamin C—it's so good for helping to repair your skin if you're out in the sun a lot. It just keeps your skin nice and fresh. Okay, plot twist. Wellness! What's your favorite way to work out, what does your diet look like, how do you stay healthy while on tour—spill. I tryyyyy to work out when I'm on the road. I don't do it every day, but I've noticed it not only helps me feel better but also really helps me breathe better while I'm singing and moving onstage. My breath support is so much better when I'm working out, so it's really important in that way too! Usually I'll try to go to a gym in or near the venue I'm performing at. Sometimes I'll FaceTime with my trainer, and we'll do a session that way too. It kind of just depends on where I'm at it. I'll try to sneak in little workouts a couple of times a week. As far as diet, I TRULY believe in the 80/20 rule. I'm 20% wine and nuggets and 80% pretty good. Balance is key. It's like, as soon as you start restricting something, it's so easy to start feeling insane around food. Agreed! Speaking of love, you work in such a stressful industry. What does your self-care routine look like when things get insane? Actually, I think I'm still learning about this, and I think every year changes as I get older and as the dynamics in my life shift. But now I've learned that I really, really like to work and keep my head down and then have something amazing to look forward to. Like, I go on vacation tomorrow with my husband for five days, and that's something I've been looking forward to! Then I'll be super, super busy for about another month or so, and then I'll have something else. I've just learned that taking bigger breaks, but not as frequently, really helps me—always just having something to look forward to. Next up: the six-step checklist for an effective workout, according to Hailee Steinfeld.